Washing your windows consumes a great deal time and energy? You can change this now – just contact our representatives and request our window cleaning in Brent Cross. We will manage this chore for you and the results will be perfect for every part of your windows – the glass, frames and ledges. With our help, you will have the freedom to do whatever you desire with the time you for the most part spend for window cleaning. But our services will give you even more, as you can see from our list of advantages. We also provide our professional services in nearby areas: Cobham, Addlestone, Weybridge, Walton-on-thames, Esher. 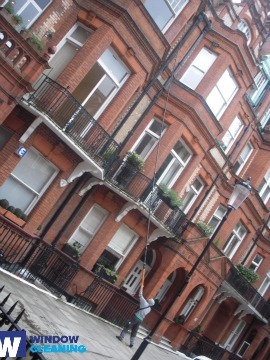 You can always rely on our workmanship and dedication for residential and commercial window cleaning. Our abilities allow us to clean all varieties of glass surfaces you could possibly have as part of your property. For example, you can order cleaning of single or double windows, French doors, sash windows, bay windows and patio doors. Moreover, we include conservatories and skylights as part of our routine. So to speak, you can fully enjoy the good look of your windows with our swift and reliable services. We provide top-notch window cleaning by using latest methods. We deliver impeccable and absolutely clean look for your glass surfaces, roof windows and conservatories with water-fed cleaning system and jet washing. The poles we use are connected to water reservoirs in our vans, thus eliminating the risk of damage to the exterior of your home or business premise. In addition, we use completely safe rope access equipment to clean glasses on high-rise buildings. You can profit from these techniques today – phone us on 020 3746 3113! We guarantee that the windows of your business premise will be clean and gleaming, like new. Achieve that by just ordering our commercial window cleaning. For windows as high as the fourth floor, we utilise water fed extension pole equipment which is completely safe and effective. London is well known-for it's tall buildings. So when it comes to those highly-placed windows we will bring into action our rope access squad. With this advanced way of cleaning, we can give you end results like no other! The specialists of window cleaning in Brent Cross will make you feel proud of your home. We provide the finest window cleaning services in Brent Cross. Our routine includes water fed extension pole system and also high-pressure cleaning. We keep your health and safety with ecologically-friendly cleaning solutions and purified water. Become part of our satisfied clients – dial 020 3746 3113 and contact our customer support centre. You can also order our services on-site – just fill in our short request-a-quote form or use our chat facility.